Marahoué was designated as a national park in 1968, after being previously established as a wildlife reserve in 1956. The park covers 1,010 sq km in central Côte d’Ivoire. Marahoué lies on the northern edge of West Africa’s Upper Guinean forest and was especially unique for its range of habitat types and great diversity of fauna (Schulenberg and others, 1999). As a transition zone between the savannas and the tropical rain forest, the park was an important center of biodiversity due to the presence of species from both savanna and forest-type habitats. The variety of environments in Marahoué also provided refuge for several rare and endangered species, including forest elephants, primates, and a wide variety of birds (Schulenberg and others, 1999). Prior to its establishment as a national park, several cacao plantations and cropland had already encroached within its boundary, covering about 3 percent of the park area by 1975. The remaining vegetation of Marahoué National Park was composed of approximately 60 percent dense forest, 15 percent degraded forest, 5 percent gallery forest, and 17 percent mosaic of savannas and thickets. In recent decades, Côte d’Ivoire has experienced some of the highest rates of deforestation seen anywhere in Africa. The non-eviction of farmers within the national park exacerbated human pressure on its resources, especially near the eastern and northern boundary. This human pressure is also related to the proximity of the city of Yamoussoukro and the Kossou dam (Denis, 2015). Wildlife and other park resources were subject to exploitation by human populations from adjacent villages and towns, mainly for game meat, wood and land for agriculture. Many people continue to cultivate and extend large cocoa plantations within the park boundaries, even though it is illegal (Schulenberg and others, 1999). 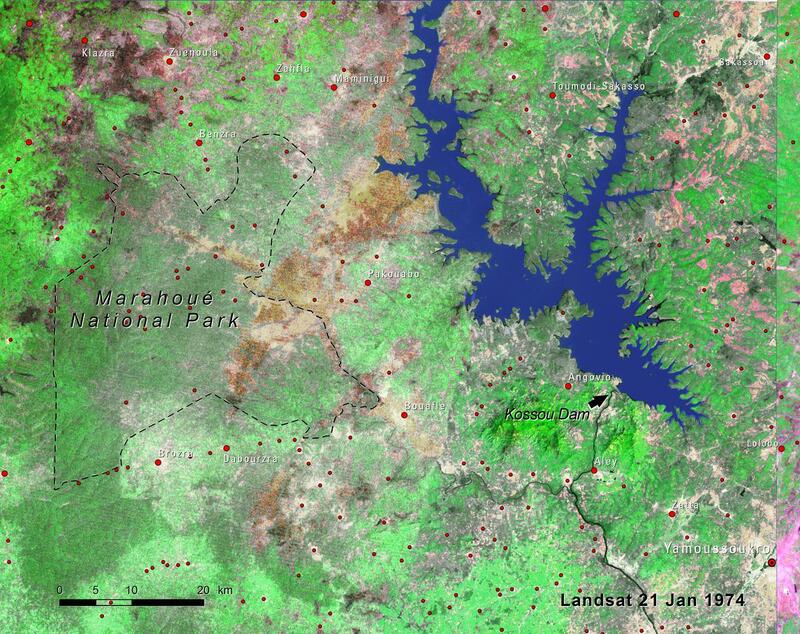 By 2014, the dense forest had totally disappeared and only few vestiges of degraded forest and gallery forest remained (12 percent and 4 percent of the park area, respectively). Agriculture and plantations had replaced natural habitats and covered about 15 percent of the park area. 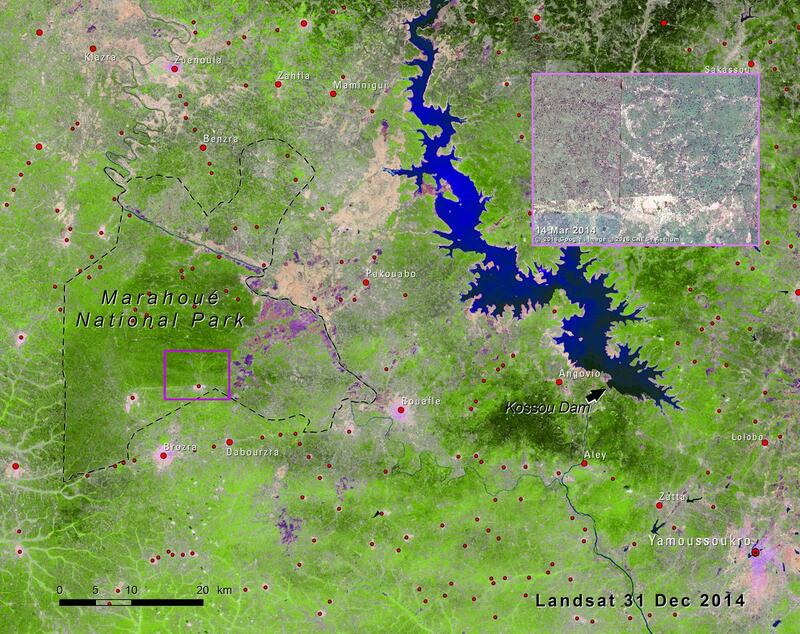 Although the land cover appears green and lush in the 2014 Landsat image, intensive deforestation had converted most of the forested habitats to savanna and thicket that now represent 67 percent of the Marahoué National Park area (see inset). Human pressure has left wide swaths of land inhospitable to most park wildlife, and today Marahoué National Park is characterized by a sharp deterioration in its natural resources. Human pressures, years of continuous poaching and the development of plantations have significantly reduced the number of animals within the park boundary (Denis, 2015). As habitat shrinks, species such as the chimpanzee (Pan troglodytes verus) were almost totally eradicated, and others, such as the forest elephants, had to be relocated to avoid conflicts with farmers (AFP, 2014).